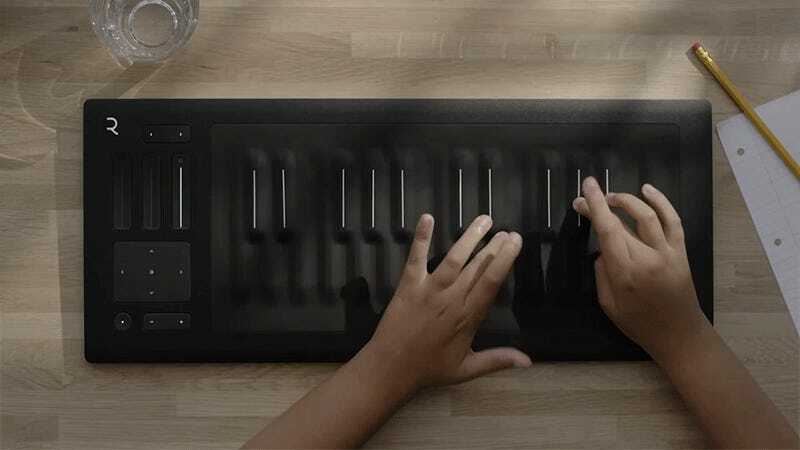 Seaboard’s Roli brought some genuine innovation to electronic keyboards (not just another Rick Astley remix demo mode) with soft touch-sensitive keys giving musicians new ways to play. And now there’s a compact version called the Rise for those who don’t have room for 88 keys—err, tubes. Why would a keyboardist want to tickle a continuous row of connected squishy keys instead of the more traditional ivories? The Rise plays just like a piano does, but those touch-sensitive keys also respond to finger gestures. Sliding a finger up and down each key can increase or decrease its volume, while wiggling a finger back and forth while pressed can let a musician bend or modulate notes. And how those gestures work is completely configurable. The Rise comes with a software synthesizer, Equator, that wirelessly interfaces with the keyboard using MIDI over Bluetooth, and its rechargeable with a built-in battery so there’s no cables to deal with whatsoever. Priced at $800, the Rise is now available for pre-order and is expected to ship sometime in October for musicians who love to jam, but don’t have room to jam another instrument into their tiny studio.